This post is by Brooks Golden. Brooks comes from several years of working on the agency side of recruiting. After witnessing enough dysfunction, he found the opportunity to change the recruitment industry for the better at Capa. He's passionate about forward thinking businesses and a culture of giving back. You can follow him at Capa Consulting Group’s blog and on Twitter. Why is this scary? 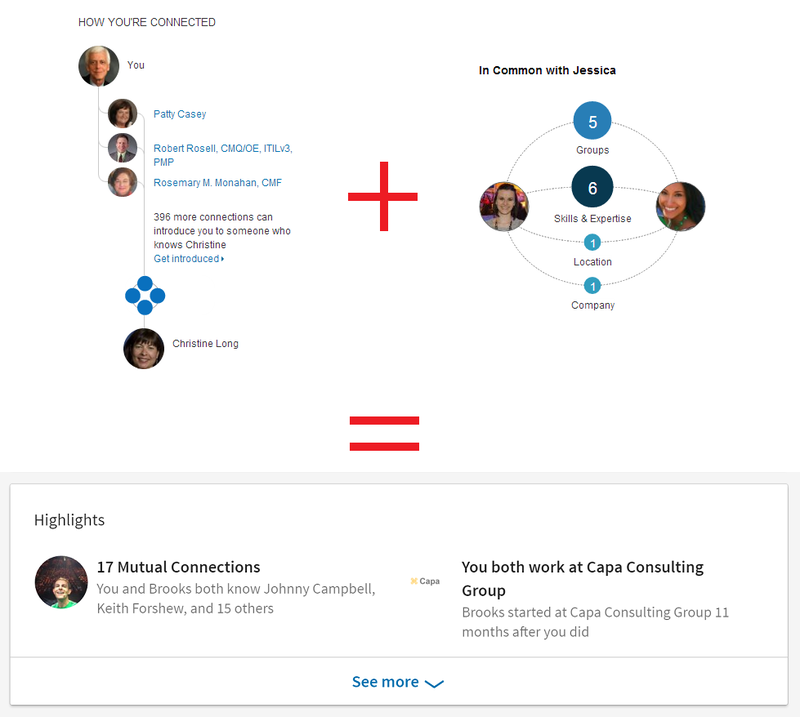 If you rely on LinkedIn to source candidates, clients, service providers, or any other business connections, the features you use may be missing. Assuming you're on a budget, upgrading to one of LinkedIn's paid plans might not be an option for you. But do you really need to? If you're in the recruiting space like us, you might have had a minor (major?) freak-out on Monday. February 6th marked the second wave of users to receive their planned redesign. They began pushing out their UI (user interface) changes to their most active users on January 19th. Unfortunately, profile sections can no longer be reordered. The new order is: Summary, Highlights (new), Posts & Activity (new), Experience & Education, Skills & Endorsements, Recommendations, Accomplishments, and influencers and companies you're Following. Want people to know what you do? Your Summary now only shows the first two lines of text, which you may want to make more concise (take at look at how I did it). The most noticeable impact is that you’re no longer able to see media or link boxes without visitors clicking See More (pic below). Aren't things great simplified? Highlights is a new section that used to be in your profile sidebar (pic below). Careful what you click! Posts & Activity now shows your Recent Activity front and center on your profile page, so your connections will see everything you recently liked or commented on (see pic below). Previously, you had to click a dropdown in someone's topcard to access Recent Activity. Now, that information is on the right side of this box and only your most recently published post on the left (instead of 3 most recent before). Want to look good? The descriptions of your previous jobs in the Experience section are now hidden by default, so connections must click See Description to access your notes on each role. Your current role, however, is expanded by default, so take advantage of attaching Media (links, photos, documents) to make your profile more attractive (pic below). What are your top talents? The Skills & Endorsements section now only shows your top 3 skills without clicking View More (top 10 before). The Accomplishments section now combines all of the following into one section with all descriptions collapsed by default: Certifications, Courses, Honors and Awards, Languages, Patents, Projects, Publications, Test Scores, and Organizations. How important are these things to you? Hidden at the bottom, realize that most won't see these. Check your links! Contact and Personal Info now shows your full website URLsinstead of just the page title. If you don't have a website on your profile, you're good. For some, that means is you can no longer hide Google Analytics tracking behind the site title (i.e., capaconsultinggroup.com vs. capaconsultinggroup.com/?utm_source=LinkedIn&utm_medium=LinkedIn+profile). Contact and Personal Info is now on your profile sidebar - see the difference in the pic below. Do you contact people globally? An awesome added feature of the new UI gives you the option to Add Profile in Another Language, which is also found in the sidebar of your profile. Although, you'll have to enter the translation yourself. *GASP* your search filters are gone!! Not quite, but there has been some changes. LinkedIn was very explicit about where to find Advanced Search filters in the new UI, pointing us instead towards Sales Navigator or Recruiter Lite premium accounts. I detail these options versus a free account below. You can no longer filter by someone's job Title. However, LinkedIn allows you to structure your search string to include a title by using "title:" (pic below). You can no longer filter by a specified distance from a zip code. You CAN search by zip code, which may require looking up what areas a zip code covers. Unitedstateszipcodes.org is a good source for that (pic below). You CAN use boolean searches, which allows you to cover multiple zip codes. With a little work, you can accomplish the same thing as a distance search. For example (see pic below), to find founders of staffing firms in a certain area, you might try: staffing (19406 OR 19405 OR 19401) title:founder. If you need Advanced Search filters, Sales Navigator and Recruiter Lite are your best budget options. They each come with their own role-specific functionality - a relationship management tool for Sales and a sourcing workflow tool for Recruiter - but they also have slight differences in their Advanced Search capabilities. Saved searches, tagging, and email alerts are no longer available for free 😢. Check out Sales Navigator and Recruiter Lite if you need these features - both have them. Great news for Notifications! They get their own page instead of a dropdown menu, which allows you to interact with multiple notifications directly instead of redirecting to individual pages. Remember that email finding trick? Gone too! You no longer have access to the account email addresses of your 1st connections, which used to be found in the Contact section of the topcard (pic below). On the bright side, if you're not currently a paying user, LinkedIn is offering a fresh set of free trials for their new UI. I used my free trial with them before and got another 1 month free to try the new interface of their Sales Navigator. Another source says you can try Recruiter Lite free for 3 months. LinkedIn will likely be pushing out new changes over the coming months. In fact, it looks like they’ve removed WeChat from my Contact Info section just during the time of writing this article. Search functions like "title:" and "lastname:" have also been acting up on me. I'm sure LinkedIn is working out the kinks as we speak. I will actively update this post for accuracy and to share any major updates. Please note any other new changes or corrections in the comments section. Happy networking!